Buffalo Bills QB Nathan Peterman will play alongside the second-string offense Thursday against the Philadelphia Eagles, according to Vic Carucci of Buffalo News. In the Bills’ first preseason game, Peterman entered late in the third quarter behind Tyrod Taylor and TJ Yates and led the Bills to their only touchdown of the night on his first drive. 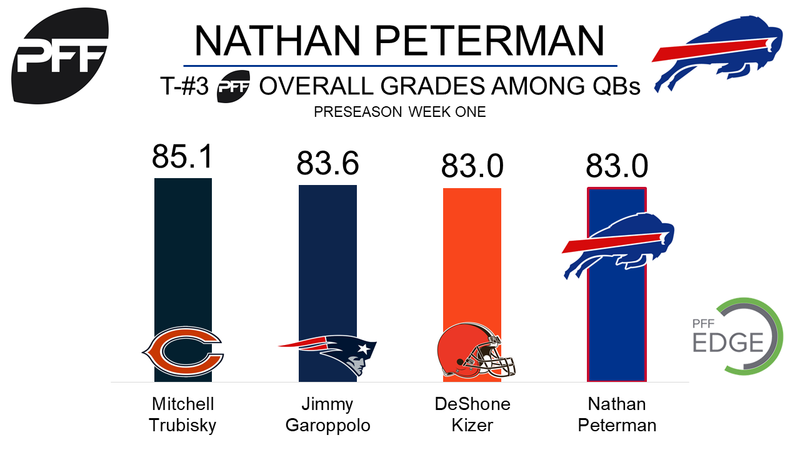 In 2016 at the University of Pittsburgh, Peterman excelled under pressure with a quarterback rating of 114.7, good for second among all Power 5 quarterbacks. He led Pittsburgh to a victory against the eventual national champion, Clemson. In his first preseason game, he struggled under pressure and did not complete a pass on 8 attempts which led to a quarterback rating of 39.6 (38th). However, he was sensational when not under pressure, completing 13 of 17 passes and achieving the 12th highest quarterback rating (112.9) on those throws among qualifying quarterbacks.